The theme of reptiles is one of the most controversial. In the East, snakes and dragons are associated with Wisdom. In the West, Reptiloids are often called the secret masters of the world financial system. The Reptiloids are mere participants of the so called Restraint Forces that help the Universal Great Experiment. So, the truth is always in the middle, like Russia, most of whose vast territories are in Asia, but the capital and the largest cities are in the European part. More than a dozen cities in Russia alone have a snake or dragon on their coat of arms. In most cases, such a reptile acts as a symbol of wisdom, longevity, luck and protection. 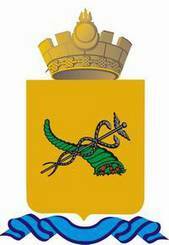 There are cities where not only the coat of arms, but the very name of city includes the serpents. Distinct Mayan city Palenque in the distant past was called “Nachin” or “City of Serpents”. 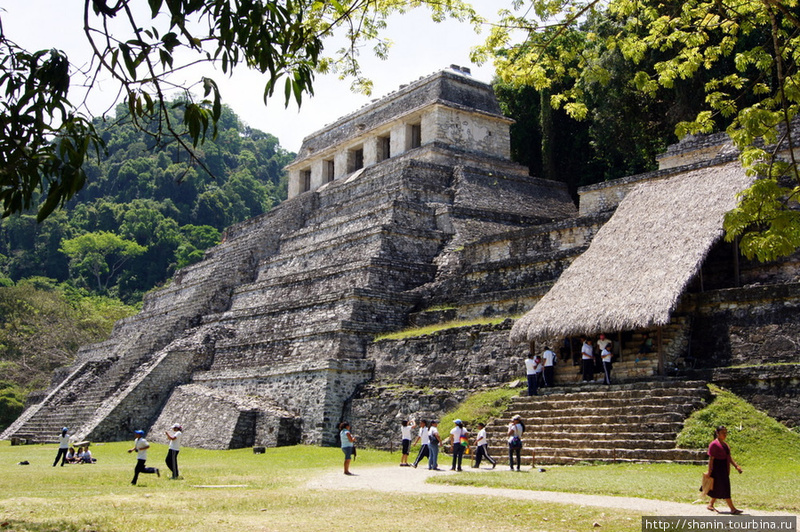 It is noteworthy that in Palenque there is the Temple of the Inscriptions that could be considered as a certain prototype of Lenin’s mausoleum. Pacal the Great buried in this tomb had similar importance to the Mayan world of the 7th century as Lenin in 20th century to the whole humanity, changing the course of world history. Tomb lid of Pacal is believed by many to show him or an alien astronaut taking off in a spacecraft-returning to the stars, etc. 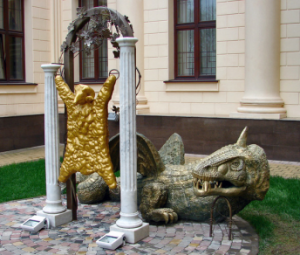 The undisputed leader among Russian cities with “reptilian” emblems and legends is Kazan with its famous Dragon Zilant. 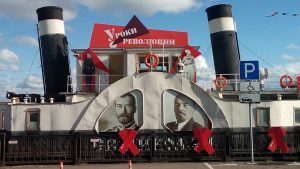 In Kazan the above-mentioned Lenin took the path of revolutionary struggle. Near Kazan is his grandfather’s estate, now very popular with Chinese tourists. China is called the Dragon because of dragon’s involvement in many Chinese mythological stories and their festivals. The Chinese dragon is often portrayed in Red-Yellow color adapting from the Chinese flag. Dragon is depicted on the coat of arms of Moscow. Today a horseman with a spear in his hand slaying a Basilisk (King of serpents) and is often identified with Saint George and the Dragon. Swiss Basel’s name is related to this Basilisk that is the heraldic animal of the city. Numerous small fountains throughout the city have Basilisks. One of them has been presented to the city of Moscow. Basel is the home to the worldwide seat of the Bank for International Settlements, an organization of central banks. Grand Prince of Rus Yaroslav the Wise (died 1054) was the first Russian ruler to have Saint George as his personal patron saint. Yaroslav’s Christian name was Yury after Saint George. Yury is a Russian-language equivalent of the name George. The French descendants of Yaroslav the Wise were deeply involved in the Order of Solomon’s Temple (the Knights Templar). Saint George was also the patron saint of Yaroslav’s great-grandson, Yury Dolgoruky, who is credited with founding the city of Moscow. The image of Saint George was very popular in Byzantine Empire founded by Constantine the Great in the 4th century. He introduced in the Roman Empire the cult of Saint George the Victorious, whose roots could be traced back to the Battle of Nibiru and Tiamat. Historically speaking, the horseman on the Moscow coat of arms represents a Russian Tsar. If it was truly Saint George than then a round halo (or nimbus) would be around his head. In the 16th century, the first Russian Tsar Ivan Grozny described the horseman as Russian Tsar. He made the heraldic emblem of Moscow an integral part of the coat of arms of Russia. 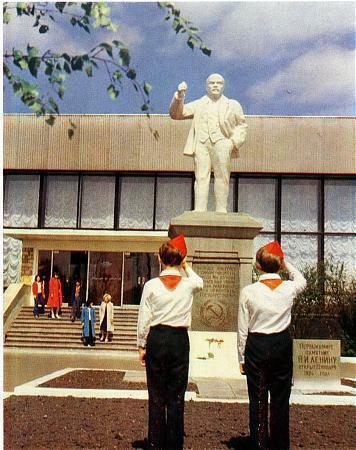 The world’s first monument to Lenin was erected in Noginsk, near Moscow. In most cases, the name of the city of Noginsk is pronounced as Naginsk. The last two letters only indicate the status of a city. The root is Nagin. Nagina is a town in Uttar Pradesh, the most populous state in the Republic of India. The state is world famous for the Taj Mahal on the south bank of the sacred River Yamuna in Agra. River Yamuga is near Moscow. Important cultural and religious centers of the whole country are located in Uttar Pradesh cities of Varanasi, Allahabad, Mathura, Vrindavan, Lucknow, etc. Allahabad is the native city of the first Prime Minister of India Jawaharlal Nehru and his daughter Indira Gandhi. The meaning of surname Nehru is practically identical to the name of Russian Lake Nero. The capital city of the state Uttar Pradesh is Lucknow whereas Lucknowo is a settlement in Russian Vladimir region, adjoining to Moscow region that still has a lot of toponymy translated from Sanskrit. 77 km. is the distance between Lucknowo and the mouth of the River Yada. Krishna was a Yadava. Uttar Pradesh cities of Mathura and Vrindavan are closely related with Krishna, a major deity in Hinduism, the eighth avatar of the god Vishnu. Krishna belonged to the Yadu dynasty. River Yada flows near Vladimir that was the capital of Russia (Rus) before Moscow. Vladimir (lit. ‘The one who possesses the world’) is the name of Lenin and Putin whose surname is also related to Sanskrit. In 1976 Indian Bollywood made a film named Nagin. According to a myth, when Cobras are of a certain age, they can assume human form. In Sanskrit, Indian king cobra is Nag. Moreover, Naga is a deity and a class of beings in the form of a serpent in Hindustan born ancient religions such as Hinduism, Buddhism and Jainism. A female naga is nagini or nagin. In Hindi, nag means “snake”. Cobra (Sanskrit: naga) is a symbol of wisdom and Kundalini, the energy of enlightenment. The Himalayan Mahatmas in their letter to the Soviet government called Lenin their brother. 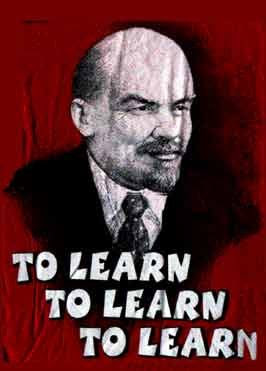 The famous Lenin phrase “Learn, Learn and Learn” is a skill formula. In Sanskrit, it sounds like “TATT-SAT-TATT” or “comprehend, endlessly comprehending”. 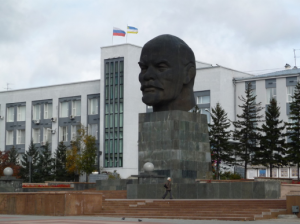 The monument of Lenin in the Urals was laid in Chelyabinsk in January 1924 right after his death (like in Naginsk). Today Chelyabinsk is also famous for 2013 meteor that the Ponokteon tried to use for getting access to the Gene Modifier that is called the Sacred Workshop of the Creator. The largest found part (~500 kg.) of this meteor is exhibited in Chelyabinsk State museum. The monument-mausoleum of Lenin in Chelyabinsk resembles an Egyptian style mausoleum with elements of oriental motifs. Its first stone was laid in sync with Lenin’s funeral procession in Moscow. His modern mausoleum on the Red Square was built later by design of famous Russian architect Alexey Shchusev (1873 — 1949), also designer for the Kazan Railway Station in Moscow. Interestingly, Moscow, Kazan and Chelyabinsk (Chebarkul) are located on the same 55th parallel. After the opening in 1925, the Chelyabinsk monument-mausoleum of Lenin served as a public library, where the works of Lenin were kept. Above the central entrance was a sign: “Learn by Lenin”. Common basis have the words Chelyabinsk and Chelo. This opens another interesting aspect of the spiritual purpose of this city and its region in Southern Urals. World Channeling Magazine №1 (13) 2014 reveals a story of Lenin’s Higher Self. It is the representative of the 5th dimension named Rainis, the master of the Harmonious Transition between dimensions and worlds, the evolution of one system into another. Rainis belongs to the Spiritual Family of the AR, which deals with the harmonization of world systems, the construction of new systems and the harmonization of existing ones. The head of this family is Edary. World Channeling №7 (25) 2015 describes Edary as the Higher Self of the last Russian Emperor Nicholas II. It was a part of Divine Duality plan for immersion of Russia into even denser layers of the Duality and the creation of a special program for the future ascent of Russia. Everyone knows that darkness thickens before dawn. Today, the Earth and humanity have begun the ascent from the 4th to the 5th dimension. Russia has got a leading role in this global process. Not by chance Russia’s official doctrine in the last century was liberation of the world from colonial and capitalist oppression (backed by Restraint Forces). Among the West European cities with mysterious coat of arms is Milan, related with Russia’s capital city of Moscow. 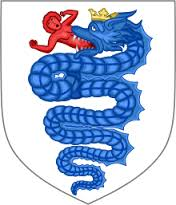 The ancient coat of arms of Milan depicts a snake holding a man or a child in the mouth. Unfortunately, there is no exact version of its origin and interpretation. This coat of arms belonged to two closely related ducal families the Visconti and the Sforza, who ruled Milan one after the other. 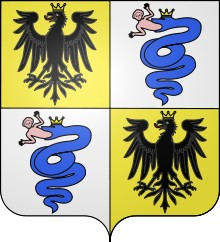 Biscione (a serpent holding a man or a child in its mouth) was the emblem of the Visconti family and appeared on their coat of arms around 1100 AD. When Visconti became duke in 1395, he added black eagles to the band, because the duchy was part of the Holy Roman Empire. The emblem began to represent a shield, two gold fields of which had eagles and two silver ones had serpents. It is also a symbolism (duality) of two principles: gold (the Sun) and silver (the Moon), the eagle (Heaven / Spirit) and the serpent (Earth / Matter). called the Feathered Serpent. According to one of the versions, Ningishzida (a representative of Nibiru) could become a prototype. 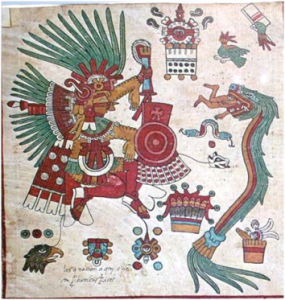 The plot of the serpent holding in its mouth a man is also found in the Aztecs. In Europe, it appeared on the coat of arms of Milan. Part of this coat of arms later appeared on the coat of arms of one of the cities of the Russian Empire. It happened after the daughter of Francesco Sforza got married to the local prince. Milan’s ruling dynasty Visconti faded after the death of Duke Filippo Visconti in 1447. He did not have heirs in the male line, but his daughter Bianca Visconti was married in 1441 by the successful Milan military leader Francesco Sforza, who with the support of his wife, began to rule the city since 1450. He was 24 years older than she. They were engaged in 1430, when she was only 6 years old. Visconti wanted this engagement to tie Francesco Sforza to the Milan Duchy. The bride’s father gave a rich dowry. This powerful soldier of fortune took the coat of arms of his father-in-law, proclaiming himself the heir of the Visconti dynasty. He completed their castle, making it his residence and decorating them with a common coat of arms. The protective structures of this castle were designed by the Tuscan Leonardo de Vinci, one of the most known representatives of the Renaissance. 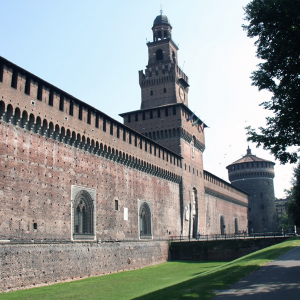 It is believed the Castle of Sforza served as a model for the Lombard architects who built the walls of the Moscow Kremlin at the end of the 15th century. In Milan and Moscow, they are likewise decorated with swallowtails. In Milan, on WT SmartCity Award 2017 (international urban & architecture ideas competition) were rewarded Richard Moreta and his team designed the most innovative and visionary new type of city for The Kingdom of Manna on the island of Los Negros. The ultimate goal is to achieve the maximum balance between quality of life and environmental impact. Richard was born in New York that has special ties with Manna and ancient ties with Russia. Francesco Sforza is mentioned several times in the famous Tuscany book by Niccolò Machiavelli “The Prince”, in which his ability to rule the state is marked. The French King Louis XI considered Francesco Sforza an example of a skillful diplomat. Sforza was in close friendship with the then ruler of Florence and philanthropist Cosimo de’ Medici. Sforza was the patron of the arts. Leonardo de Vinci worked at his court. Francesco Sforza’s son ordered Leonardo the famous “Last Supper”, a mural on the rear wall of the refectory in the Dominican convent of Santa Maria delle Grazie in Milan, depicting the scene of the last supper of Christ with his disciples. It became the most popular work of Leonardo and an important milestone in the history of the Renaissance: correctly reproduced depth of perspective changed the direction of the development of Western painting. 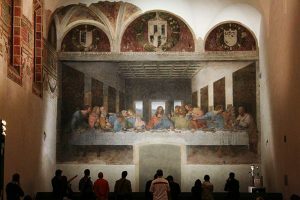 There have been a lot of rumors and myths about the “Last Supper” from the very beginning to Dan Brown’s “The Da Vinci Code”. This author of conspiracy thrillers claims that the Apostle John, who bends over to Peter, is in fact a woman, Mary Magdalene, probably the wife of Christ. However, the contours of their bodies rather do not form the letter “M”, which supposedly means “Matrimonio” (“marriage”). They rather form the letter “V” that is the signature of Leonardo da Vinci. A former rock musician, an English teacher, and the author of such a book “187 Men to Avoid: A Guide for the Romantically Frustrated Woman” says nothing about the Russian trace in the history of the Knights Templar. Noteworthy is the story of painting images of Christ and Judas on the “Last Supper”. Leonardo was to portray the Good embodied in the image of Jesus and Evil embodied in the image of Judas, who decided to betray him at this meal. For a long time he could not find the models from which these figures could be painted. As a result, he found in the church choir a young chorister who approached the image of Christ. However, the artist had to search for another three years of the model for Judas, until he accidentally stumbled upon a drunkard lying in a gutter. It was a young man, but prematurely senile, dirty and tattered. Leonardo depicted on the canvas the sinfulness, selfishness, wickedness expressed on the face of the Judas’ model. Then it turned out that this is the same model from which Leonardo had previously painted the image of Jesus for this fresco. Milan is also important for Christianity. Emperor Constantine’s Milan Decree declared equal rights to the Christian religion. Constantine introduced in the Roman Empire the cult of St. George the Victorious, whose roots go back to the Battle of Nibiru and Tiamat. The coat of arms of the Sforza / Visconti painted lunettes over the «Last Supper», formed by a ceiling with three arches. According to one version, this story symbolizes the strength and victories of Milan. Other version states that the serpent from the mouth of which the baby appears, symbolizes the awakening force combined with wisdom. Today, Milan has a different coat of arms. It is the red cross of St. George on a silver field. 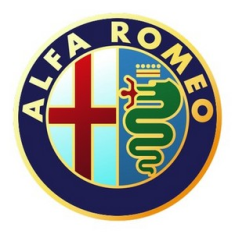 The image of the serpent with the child uses in its symbol the car company Alfa Romeo created in Milan. It has combined both Milanese coats of arms: in a halved circle, in the left half there is a cross, and in the right half there is a crowned serpent, from the mouth of which a baby appears. Pruzhany is town in the Brest region of modern Belarus. It has been known since 15th century. The daughter of the above mentioned Sforza of Milan, through the marriage in 1518, became the Queen of Poland and Grand Duchess of Lithuania. She brought the Milanese coat of arms Biscione to the Belarusian Pruzhany, formerly part of the Cobrin Principality. The name Cobrin comes from Cobra, but cobras have never existed in this northern region. The snake is one of the most ancient and deep symbols. Not an exception is the name of the principality coming from name of the town of Cobrin. In 1588, Queen and Princess of the Grand Duchy of Lithuania Anna Jagiellon (widow of Stephen Bathory who owned Pruzhany after the death of her mother Queen Bon Sforza) granted Pruzhany Magdeburg Law with the status of the city, seal and coat of arms. According to historians, the name of Pruzhany is connected with the settlement here of the Prussians, a cluster of Baltic tribes that inhabited the south-eastern coast of the Baltic Sea. In the 13th century with the help of Polish king, the Prussians’ lands were conquered by medieval Catholic military order of German crusaders who created there the monastic State of the Teutonic Order. The Prussians were Germanised and Polonised. Some of them escaped to Russia, including the founder of the Russian Romanov family Procopius the Righteous. In time due, the coat of arms of Pruzhany has been changed. In 1845, fir-tree appeared on it. On this spruce was a silver hunting horn. The fir-tree and the horn pointed to the famous Belovezhskaya pushcha (forest) which is located near the town of Pruzhany. Today, Belovezhskaya pushcha is better known as a sad place where the collapse of the Soviet Union was formalized. In the past, Belovezhskaya pushcha was owned by the Russian Emperors. Long ago, among the Germanic peoples, fir-tree was sacred. They treated it as a prototype of the World Tree. In the 20th century Stalin decided to carry on the tradition of Christmas tree brought to Russia from Prussia by its princess that became the wife of Russian Emperor Nicholas I. Former Christmas tree became a symbol of the Soviet New Year. The tradition of New Year goes back to Sumer that was considered to be the cradle of modern civilization until the findings of Tartaria tablets in Transylvania. In Sumerian mythology, the appearance of their civilization is associated with Nibiru, whose representatives left the New Year to them, as a memory of their visit to the Earth and the creation of man. In fact, they were not creators of the mankind, but just were playing gods to persuade people obey them and dig gold for Nibiru. The above hunter’s horn on the Pruzhany emblem could have an interesting historical parallel. The blue hunting horn in the golden field is the coat of arms of the first feudal rulers of the small sovereignty of Orange in the south of France, next to the Languedoc. Roman Orange was founded in 35 BCE by veterans of the second legion as Arausio (after the local Celtic water god). The name was originally unrelated to that of the orange fruit, but was later conflated with it. The sovereign Carolingian counts of Orange had their origin in the 8th century, and passed into the family of the lords of Baux. From the 12th century, Orange was raised to a minor principality, the Principality of Orange, as a fief of the Holy Roman Empire. When William the Silent, count of Duchy Nassau (located in what is now the German states of Rhineland-Palatinate and Hesse), with estates in the Netherlands, inherited the title Prince of Orange in 1544, the principality was incorporated into the holdings of what became the House of Orange-Nassau. Their descendants played an important role in European politics. Prince Wilhelm I of Orange was one of the leaders of the Netherlands revolution and the Reformation of the 16th century. Wilhelm III of Orange, the ruler of the Netherlands, became the king of England and Scotland. In his reign began a rapid rise in England and its transformation into a powerful world power. He carried out profound reforms that laid the foundation for the political and economic system of the country. Nassau is also part of the name of the Dutch Royal Family, which styles itself Orange-Nassau. The title of Prince of Orange is used as the Head of the Hohenzollern family, the German dynasty, from which were the rulers of Brandenburg, the kings of Prussia, the Kaisers of Germany. The Hohenzollerns were in direct relationship with the Romanovs. The Catholic branch of the Hohenzollerns ruled in Romania. Tsarskoye Selo or Tsar’s Village is now town of Pushkin. 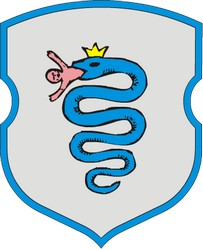 The serpent biting its tail was placed on its coat of arms by the order of Catherine the Great of Russia (1729 – 1796). She was born as a German princess in Slavic city of Stettin, Pomerania, Prussia (now Szczecin, Poland). 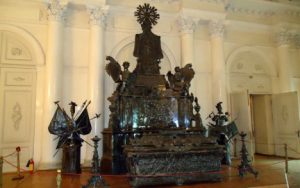 Catherine the Great is Russia’s longest-ruling female monarch. Under her governance the Russian Empire was expanding rapidly by diplomacy and conquest / return of the former Russian lands in the south and south-west. In the east, Russia started to colonize Alaska, establishing Russian America. In her time, often considered the Golden Age of the Russian Empire and the Russian nobility, Tsarskoye Selo became the country residence of Russian emperors. In the second and fourth parts of the shield, the eagle holds a torch with a flame in its right paw and an anchor in its left paw. On the eagle’s chest is an oval shield with a cross, bordered by a golden serpent biting its tail, symbolizing the wisdom and eternity. Tsarskoye Selo (today Pushkin) is a twin-sister of Valdai town. Valdai Hills are reasonably associated with the legendary Mount Meru from the Mahabharata and Mount Hara from the Avesta. Valdai is the source of Volga and other major European rivers. Catherine the Great in 18th century gave the coat of arms with serpents not only to Tsarskoye Selo, but also to city of Ulan-Ude, the capital of modern the Republic of Buryatia of Russian Federation. Buryatia is located in the south-central region of Siberia along the eastern shore of Lake Baikal. Ulan-Ude was settled in 1666 by the Russian Cossacks as a fortress on favorable geographical position. It grew rapidly and soon became a large trade center which connected Russia with China and Mongolia. 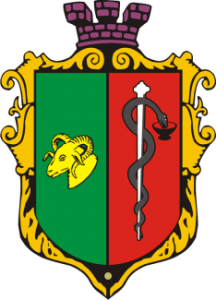 Therefore, on Ulan-Ude’s coat of arms are the crossed cornucopia and the Mercury Rod (Caduceus), braided with two serpents. 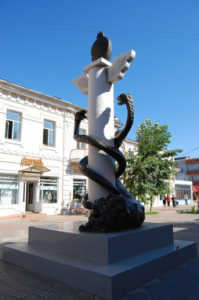 Ulan-Ude is twinned with city of Kazan famous for its Zelant Dragon (Serpent). It is symbolic that the composition and elements of the coat of arms of Ulan-Ude are very similar to the coat of arms of Kharkov. On the coat of arms of Kharkov, the cornucopia is folded upwards, in the form of the letter “X”. Thus, the Kharkiv cornucopia seems to be filled with fruits, whereas the Ulan-Ude’s cornucopia (bent down) seems to be pouring. Plus, the coat of arms of Ulan-Ude is crowned with a golden crown with a Soyombo (Sanskrit: “self-created”) that is Buryat symbol of eternal life (sun, moon, and hearth), a circle with a crescent moon at the bottom, and a flame of three languages above. During the reign of Catherine the Great, Ulan-Ude was the largest center of trade on the eastern part of Lake Baikal, linking European Russia (and through it Western Europe), Eastern Siberia, the Far East, Central Asia, China and Mongolia. It is believed that the large trade transactions were the main reason for appearance on its coat of arms of the cornucopia and the Rod of Mercury (the Roman god of trade), whose image is linked to the Egyptian god of wisdom Thoth. The symbol of Buryatia (a golden soembo on a blue background) is depicted on the flag of Ulan-Ude. It is not difficult to notice that these colors, like the flag of Ukraine, are yellow-blue. In heraldry, golden color serves as a symbol of wealth, justice, generosity, and blue is a symbol of beauty, softness and greatness. Kryon says that the color of the frequency of his magnetic energy is yellow-blue. One of the most recognizable symbols of Jerusalem, the Dome of the Rock Mosque, is made in the same colors by Suleiman the Magnificent, whose wife was from the territory of present-day Ukraine. The name of the mountain on which this mosque is located is Moria. certain parallels with the painting of Nicholas Roerich “The Phenomenon of the Term” created in Ulan Bator (Mongolian capital) located ~440 km. south from Ulan-Ude. The Roerich’s painting depicts the head of an awakened hero in a helmet, in whose face the features of Lenin are recognized. His look is directed to the awakening East, showing great interest in the liberation ideas and personality of Lenin. The Buddhist world perceived this as a sign of the onset of the New Era. The painting “The Phenomenon of the Term” was created in Urga (the root UR) / modern Ulan Bator in 1927. It is known it was a sketch of the project of the above-frescoes of the future temple dedicated to the Lord of Shambhala. In this Temple, the painting “The Great Horseman” was to be kept. After the revolutionary events, Urga was renamed in 1924 in Ulan-Bator, i.e. The city of the Red Hero, in honor of the High Buddhist Ideal. In inscrutable ways the painting “The Phenomenon of the Term” was transferred to Soviet Russia and presented to the famous writer Maxim Gorky. After his death, according to his will, together with the Roerich’s Maitreya series of his paintings, it was given to the Nizhny Novgorod Art Museum, where it is still kept. According to Buddhist tradition, Maitreya is a bodhisattva who will appear on Earth in the future, achieve complete enlightenment, and teach the pure dharma. Maitreya will be a successor to the present Buddha, Gautama Buddha (also known as Sakya muni Buddha). Evpatoria is one of the oldest cities in the world. It is over 2,500 years old. Here people of different religions and different cultures have been living peacefully for centuries. In the center of this town there are temples of the major world religions. For this reason, the old district of Evpatoria is called “Small Jerusalem”. In 1844, the coat of arms of Evpatoria was approved. It depicts a golden sheep’s head and a serpent drinking from a bowl, wrapping a silver rod. Being an emblem of medicine, it symbolizes the Saky muds which are famous for their usefulness. Their name derives from the Scythian tribe of the Saky (Saki). It is believed that the ancestors of Buddha Sakya Muni belonged to this huge Scythian tribe. Buddha lived and taught mostly in the northeastern part of ancient India in the circa 6th century BCE. His title Sakya Muni basically means Sage (muni) of the Sakya clan that was a clan of the late Vedic India (circa 10th – 5th centuries BCE). It is believed that the golden sheep head on Evpatoria’s coat of arms indicates favorable conditions for sheep breeding of the Karakul breed in this part of the Crimea, as well as for a large number of jewelry crowned with the golden head of a ram, found by archaeologists around Evpatoria. However, even with the usual look, the striking is discrepancy between the sheep on the coat of arms and the version of sheep breeding. Based on this version, there should have been a Karakul fine-wool sheep. Instead, on the coat of arm is the head of an adult ram, on which there is no fur. The version of Scythian ornaments crowned by a golden ram’s head gives interesting clues. The first recorded settlement in the area was built by Greek colonists around 500 BCE for protection from the Scythians and was named after the king of Pontus king Mithridates VI Evpator, who is widely recognized as one of the outstanding figures of his time. From his nickname Evpator (“of noble father”) modern Evpatoria derives its name. This educated in the best traditions king led his male ancestry from the Persian dynasty of Achaemenides founded by Cyrus the Great. Evpator’s mother was from the Greco-Macedonian dynasty of Seleucids founded by one of the diadochos of Alexander the Great. All his life Mithridates VI Evpator fought with Rome and its greatest generals. Once he was defeated in Greece in Orchomenus, the setting for many early Greek myths. The legend of the Golden Fleece is connected with the king of this ancient city. In ancient Greek mythology, it is said that the children of the Orchomenus King Athamas (“rich harvest”) on the back of the ram went to the shores of Asia, fleeing from the persecution of their stepmother. Having reached Colchis (modern western Georgia), the ram was sacrificed to Zeus, and the removed Golden Fleece was donated to the king of Colchis. Later, the king’s daughter Medea helped Jason acquire the fleece and fled with him to Greece. She became the wife of Jason, they have two sons, but the finale of this story was sad. After Jason’s decision to marry again, Medea punished her rival and killed their young sons on the Jason’s eyes. There is something deeper here than just a story. Aries (Ram) is the first sign of the Zodiac and the symbol of the Sun. The constellation Aries is named after the ram of which the Golden Fleece was obtained. When the Earth enters the constellation of Aries on March 21, the spring begins in the Northern Hemisphere. This day is the day of the vernal equinox. Rama is the hero of the ancient Indian epic. Today a famous spiritual teacher is also known as Ramtha (or Ram). He has passed through Enlightenment and Ascension and is a member of an invisible brotherhood that deeply loves humanity. He incarnated about 35,000 years ago and in the language of that time his name meant “God”. Having conquered three quarters of the known world, he admitted that his greatest conquest was the conquest of himself. The core of Ramtha’s teaching is the realization by the humans they own divinity. Ramtha ascended on the northeast slope of the Indus Mountain on the Indus River in front of his people. Before that he had taught them for 120 days about the Unknown God whom the Lemurians worshiped. Today’s Ramtha teaching has been chandelled via JZ Knight, an American New Age teacher and author. During Ramtha’s lifetime, she was his beloved daughter Ramaya and was the first one to become Ramtha’s adopted child. Ramtha found Ramaya abandoned on the steppes of Russia. He was a Lemurian warrior who fought the Atlanteans over 35,000 years ago. Saki or Saky were one of the branches of the Scythians. Saky lived on a vast territory including the Crimea. As it is said above, the ancestors of Buddha Sakya Muni belonged to this huge Scythian tribe. Saki is a village within greater Mumbai. South to Mumbai came ashore in the 15th century the first European who reached India. In was Russian adventurer Afanasy Nikitin. He died near Russian city of Smolensk on his way back from India to his native Tver. ~80 km. north to Smolensk is the village Saki. Also, villages named Saki are in Iran, Poland, Azerbaijan, etc. Azerbaijani Saki is ~ 240 km. northwest from Baku and ~ 114 km. west of Cuba. The name of Azerbaijan town Saki goes back to the ethnonym of the Saki. They reached the territory of modern-day Azerbaijan in the 7th century BCE and populated it for several centuries. The traces of original large-scale settlements in Saki date back to more than 2700 years ago. In the 1st century, Saki was one of the biggest cities of the Caucasian Albania whose capital was capital during antiquity was Kabala. The main temple of the Caucasian Albanians was located there. The kingdom of Saki was divided into 11 administrative provinces and was one of the important political and economic centers before the Arab invasion. 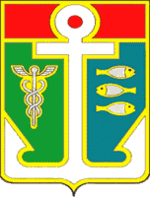 Unique is the coat of arms of town Saki located in the Crimean peninsula (western coast), just 22 km. from above mentioned Evpatoria. It depicts a dinosaur within a structure resembling an Egyptian pyramid. Above the dinosaur are three stars akin to the three stars in the Orion Belt that was very sacred to the ancient Egyptians. On the right side is a wise serpent on a stick, ancient symbol of medicine (the Rod of Asclepius). Other reptiles like dragons and serpents have adorned the heraldry of European cities for distant times. However, no one else has a dinosaur on its coat of arms as Saki. Dinosaurs are one of the oldest creatures on the planet. 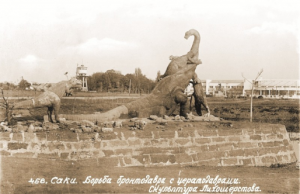 The world’s first monument to dinosaurs was established only in 1932 in the resort town of Saki, during the reign of Stalin. The very appearance of such a monument (dinosaurs) was a phenomenon. At that time were created only monuments dedicated to people of labor, athletes, leaders of the proletariat. The sculptural composition was called “Fighting Brontosaurus with Ceratosaurus”. 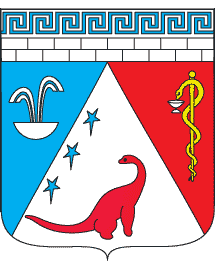 In its center was a bronzosaur (depicted on the Saki’s coat of arms) attacked by predatory ceratosaurs. According to the sculptor’s plan, the Brontosaurus is the victim of an attack by small predatory dinosaurs. It curved, trying to get rid of one of them, which is about to bite its neck. Ahead of this herbivorous brontosaurus, the second predator grabbed, hampering its movements. Next to them is the third of the attackers, waiting. In the description of the coat of arms of Saki it is stated that three stars above the bronzosaur are reminiscent of the chumaks (merchants or traders in salt) that transported salt by the Chumaks’ Way from the Black Sea coast of the Crimea from the 16th to the 19th centuries. In Ukrainian language Milky Way is called the Chumaks’ Way. The ancient Egyptians called it the Celestial Nile which they saw in the night sky. The three stars on the Saki’s coat of arms very accurately convey the location of the three stars in the Belt of Orion. 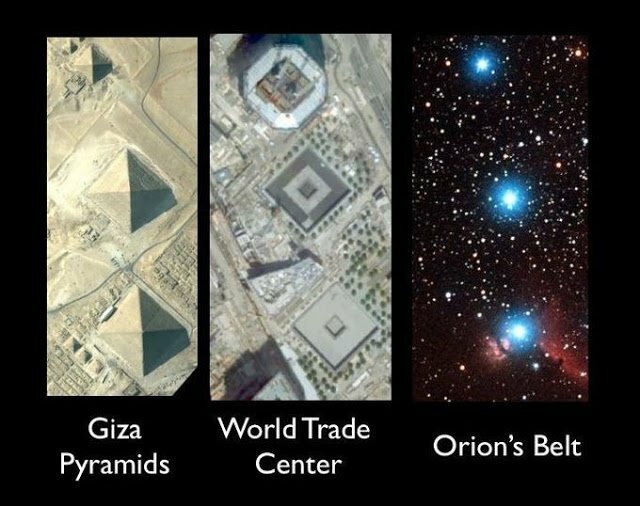 It is believed that the world famous three pyramids in Giza are the reflection of these three stars in the Belt of Orion. The meridian, on which the pyramids were built (by the Lemurians) is also named the Nile meridian. On the coat of arms the bronzosaurus stands in the pyramid. The lower rays of the three stars are deliberately elongated to face the ground. This is how often the connection of stars in the Belt of Orion with the pyramids in Giza is depicted. Saki is twinned with Protvino that is a town in Moscow region. Protvino is located 10 km. from Serpukhov on Oka River. The Rosatom Institute for High Energy Physics opened in Protvino in 1965 is one of the largest physics research centers in Russia and the main town forming enterprise. Until 1972, Protvino had the world’s largest proton accelerator (hadronic collider). Another twin city of Saki is Grozny, the capital city of the Chechen Republic, Northern Caucasus. In Russian Grozny means “fearsome”. It is the same word as in Ivan Grozny, the first Russian Tsar (16th century). In Sanskrit, fearsome is “ugra” that is one of the titles of god Shiva (Sanskrit: Siva). The first wife of Ivan Grozny was from the Romanovs who would later become next Russian ruling family. After her poisoning by the enemies of young Tsar Ivan, he married second time. His bride was from Kabardia (Northern Caucasus). In 1395 it was the place where the two most powerful armies of that time met for fearsome battle. The first army was led by Samarkand ruler Tamerlane and the other one was the Golden Horde led by Khan Tokhtamysh. In 1391 they already fought each other near Samara on the Volga River. In 20th century Samara was named the cosmic capital of the Soviet Union. During the Second World War Samara was the second capital of the USSR. In May 2012, Grozny became a sister city with the ancient Sivas (modern Turkey) whose history is also connected with Timur. The Saki tribes lived on vast territories including Central Asia in the 18th to 4th century BCE. Later, in 14th century AD, invincible Timur (ending Ur) built his empire on these lands. His capital was ancient Samarkand (over 2750 years old). One of the first self-names of the Saki people was discovered on the plate of the famous Assyrian king and librarian Ashurbanipal. From his large library excavated in the 19th century, the modern world has learned about the Sumerian origins of the Old Testament and the daily life of ancient Mesopotamia. the forerunner of the Sumerian civilization was the Ubaid culture with its Reptile cult. Zmeinogorsk means Serpent Hills. It is a Russian town located in Altai Krai (Southern Siberia). This area is part of a great crossroads in the ancient world. This region of Siberia is extremely important due to its biodiversity. The Altai bees produce some of the world’s finest organic honeys. In ancient Indian traditions, honey (Sanskrit: madhu) is the synonyms of wisdom. The region’s main waterway is the Ob River originated in the Altay Mountains. Ob’s length is 3 650 km. It is the world’s seventh-longest river and the westernmost of the three great Siberian rivers that flow into the Arctic Ocean. The Gulf of Ob is the world’s longest estuary. The source of the Ob River is the Lake Teletskoye and a glacier on Mount Belukha that is Siberia’s highest peak (4506 m.) and one of the most significant mountains of Russia. Mount Belukha is believed to be the gates of secret tunnels to Shambala. Zmeinogorsk is well known for its ancient mines. 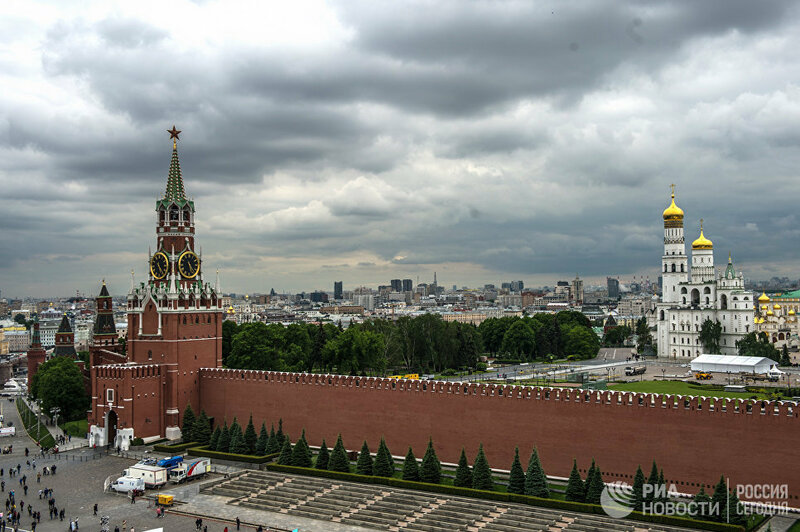 It was founded as a fortress and a mine in 1736 and was the main supplier of silver and gold to the Russian monarchy for more than 100 years. In 1736 people of Akinfiy Demidov (a Russian industrialist of the Demidov family who raised it to one of Russia’s most important industrial dynasties) discovered the richest deposits near the Serpent Mountain. The famous mine was laid here. It ensured the glory of the Altai as a mining region. By the order of Russian Empress Elizabeth (daughter of Peter the Great, the founder of Saint-Petersburg), silver found here was used for the manufacture of Alexander Nevsky tomb weighing 1,5 tons for the Trinity Cathedral of the Alexander Nevsky Lavra in Saint-Petersburg. This tomb has become one of the outstanding works of Russian decorative and applied art. 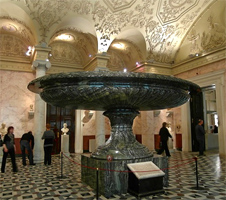 The tomb has been in the State Hermitage Museum since 1922. The Hermitage also houses another famous exhibit related to Zmeinogorsk. It is the Great Vase made of jasper extracted in the vicinity of Zmeinogorsk. Jasper is the birth name of the first Monarch of the present Kingdom of Manna. This elliptical Great Vase is the largest vase in the world. Its weight is over 19 tons, the height with a pedestal is over 2.5 meters. Today it is one of the state symbols of the Altai Krai, depicted on the coat of arms and the flag of this region. Broadly speaking, vase is big bowl. The most famous and sacred bowl belonged to Buddha. Zmeinogorsk grew rapidly during the 18th – 19th centuries. It was the Altai’s center of engineering thought and the most advanced technologies. Many famous Russian and foreign travelers visited the town. Famous Russian writer Dostoevsky often came to Zmeinogorsk for a date with his future wife. In his letters he often called this town Zmiev (town of Serpent). Zmiev is a town in Kharkov region of Ukraine. 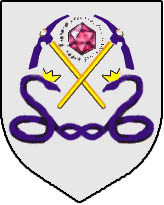 The cost of arms of Zmiev depicts the Serpent-Queen. The town is located on the famous Izyum Trail or Izyum Warpath. In Russian, izyum means “raisin”. Izyum Trail was a historic route used by the Crimean Tatars in the 16th and 17th centuries to invade Russia. In the mid-17th century, the route fell into disuse due to the establishment of Kharkov and other Cossack forts led by their ataman. In the 17th century, on Zmiev’s coat of arms was depicted not only the Serpent-Queen, but also the coat of arms of Kharkov that was then the provincial center. In the main Russian Orthodox cathedral of Kharkov is a large fresco of Procopius the Righteous, the founder of the Romanov dynasty which ruled Russia from 17th to 20th centuries. 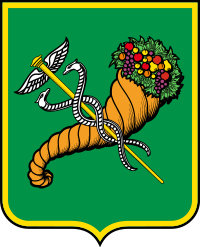 Kharkov’s coat of arms depicts a horn of plenty (cornucopia) and a staff of Mercury (caduceus). Officially, they were symbols for agriculture and trade. As always, there are deeper layers. A caduceus (a golden rod) entwined by two serpents is an attribute of the messenger of the gods and sage Hermes. According to the legends, the Caduceus had the ability to lull people and awaken them from sleep, which can also indicate a dream of consciousness while in Duality. Hermes acted as the tutor of Eros who was god of love in ancient Greek mythology. Apparently, it is no accident in ancient India there were practices of expanding consciousness through the awakening of Kundalini during tantric studies. It is known that the Kundalini (serpent energy leading to Enlightenment) contains a multidimensional genetic code that, when activated, will allow mankind to actively develop as multidimensional beings associated with all dimensions of the Universe. This energy is directly connected with the Pleiades Serpents which are its carriers and keepers. Sumerian vase dedicated to Ningishzida (21st century BCE). The Caduceus is interpreted as depicting Ningishzida himself. 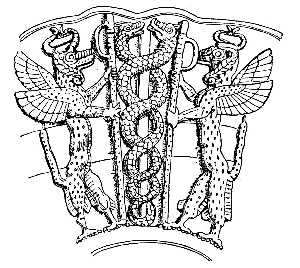 The oldest known imagery of the Caduceus is attributed to the Sumerian (ultimately Nibiruan) god Ningishzida whose symbol, a staff with two snakes intertwined around it, dates back to 4000 BCE to 3000 BCE. Caduceus was on a punch-marked coin of Buddhist king Ashoka in India, 3rd to 2nd century BCE. It is suggested that Caduceus was his personal symbol and mudra (Sanskrit: “seal” or “gesture”). 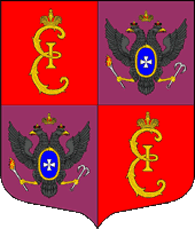 As it is said above, in the 17th century the Caduceus was placed in the upper part of the coat of arms of Zmiev as a symbol of the Kharkov viceroyalty. The distance between Zmiev and Kharkov is symbolic 40 kilometers. The southern lands of the Voronezh region were partly transferred to Kharkov viceroyalty. 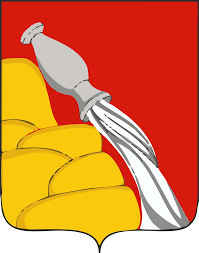 The coat of arms of Voronezh depicts a pitcher pouring water. The mankind is entering into Aquarius Era. Its motif is fully expressed in the coat of arms of Veliky Ustyug. In Russian, Cobrin means “a place of cobra”. The first mention of Cobrin dates back to 1287. It was found in the Ipatiev Chronicle, discovered in the Ipatiev Monastery near Kostroma. Moreover, in this monastery in 1613 the Romanovs were summoned to the Russian throne. 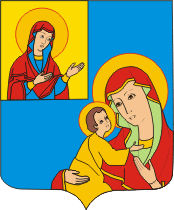 The Cobrin coat of arms depicts the Virgin Mary and her mother Saint Anne. It was in honor of the mistress of the city Anna Jagellonka, the granddaughter of the Milanese Duke Sforza. She was a daughter of Polish King Sigismund I the Old and his Italian wife Bona Sforza. In 1589, her nephew Sigismund III, the King of Poland and the Grand Duke of Lithuania, gave her Cobrin with the surrounding lands. The depiction of St. Anna on Cobrin’s coat of arms is very symbolic. The name Anna means “Grace”. In the Sumerian language, AN meant “Heaven” and ANNA meant “Stone from Heaven”, i.e. the bronze, the metal which was of great importance for the development of human civilization. On Cobrin’s coat of arms, the baby Jesus points to the throat chakra of the Virgin Mary. Symbolically, this means that the higher consciousness personified by Jesus comes with the opening of this chakra of wisdom, called Vishudha in the Indian teachings. Same type of icon is the Our Lady of Kazan. 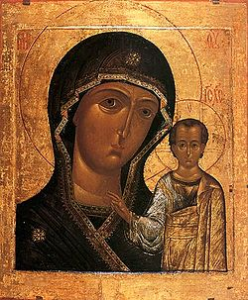 On the same day (July 21) two holidays are celebrated: the Kazan Icon of Our Lady miraculously emerged in the reign of Ivan Grozny and the day of the memory of Procopius the Righteous, the founder of the Romanov family. Procopius the Righteous was sainted in the mid-16th century by Ivan Grozny. His wife Anastasia was a descendant of Procopius the Righteous and the great-aunt of Michael I of Russia, the first Tsar of the Romanov dynasty. There are more than 140 images (icons) of Our Lady, but only Her Kazan icon has been to Cosmos. It was sent there in 2011 to the International Space Station. The icon had been handled by the Patriarch to Anatoly Perminov who was at that time the head of Roskosmos (Russian Federal Space Agency). His surname comes from Perm. Anatoly Perminov is a native of the neighboring Kirov region. The name of Kirov region is linked to the Cyrus the Great (Russian: Kir). The Kirov region is not included in the habitat of the cobra. Nevertheless, the Cobra is the name of two rivers and settlements in the Kirov region. In Indian practices, a cobra symbolizes the Kundalini energy curled at the base of the human spine. The ascent of the Kundalini leads to Enlightenment, also called Moksha. See Russian river Moksha. Cobra (tributary of Vyatka River) has a length of over 320 km. Its source is on the Northern Ridge (Russian; Severnyye Uvaly), rightly associated with the World Mountain (Hara Berezaiti, literally meaning “High Watchpost” of the ancient Zoroastrian scriptures of the Avesta; Mount Meru from the Mahabharata, the major Sanskrit epic of ancient India). This River Cobra is a tributary of the river Vyatka that is a tributary of the Kama River. In Sanskrit, Kama means “love”, “sensual attraction”. In Hinduism, Kama is the god of love, the son of Lakshmi and Vishnu. According to legend, Shiva incinerated Kama with the look of his third eye. In Sanskrit, Siva (Shiva) means “good”, “gracious”. The Siva River is a tributary of the Kama River,. Siva flows through the territories of the Perm Krai and Udmurtia and flows into the Kama below the dam of Votkinsk Hydroelectric Station, near the town of Tchaikovsky. The largest settlement in the valley of the river Siva is the city of Votkinsk. Another river Siva carries its waters in the Sverdlovsk region. The mouth of this river is near the town of Verkhnyaya Tura, where the Siva flows into the Tura River. Alexander the Great, risking his life, stubbornly walked into the Egyptian oasis of Siva (Siwa) to get divine revelations. Cobra (tributary of the Molomy River) has a length of over 65 km. On this river there is a village Darovskaya. It is a couple of dozen kilometers from the source of this Cobra River. The name Darovskaya is related to the name Darius. In ancient Persian, the name Darius means “Keeping the good”, “Good-natured”. Persian king Darius I, who ruled in 522 — 486 BCE, is known as a wise ruler, respected even by his enemies. Although the campaign of Darius on the Black Sea Scythians ended in vain, he called them in his documents “overseas Saki” (see above about the Saki). The wife of Darius I was the daughter of Cyrus the Great, the founder of the Persian Achaemenid power, one of the most powerful rulers in human history. The image of Cyrus left a deep imprint in the ancient Eastern and ancient literature. His name in Russian (Kir) is the root of the surname Kirov, a famous revolutionary born in Kirov region. Sergei Kirov was a close friend and comrade-in-arms of Stalin. The modern name of Kirov region derives from the surname of Sergei Kirov. In 1945, in the Kirov region, Anatoly Perminov was born. He served as the Head of Russian Federal Space Agency (Roscosmos) in 2004 — 2011. He received from the Patriarch of the Russian Orthodox Church at the Moscow Cathedral of Christ the Savior the Kazan Icon of Our Lady for sending to the Cosmos. Famous Russian astronaut Viktor Savinykh was born in 1940 in the village Berezkiny of the Kirov region. Viktor Savinykh is twice Hero of the Soviet Union. City of Berezniki is located on the banks of the Kama River, in the Ural Mountains, in Perm Krai. Boris Yeltsin (1931 – 2007), Russia’s first president, attended High School in Berezniki. This Perm Krai Berezniki has formed the worldview of many famous Russians. See above the Hara Berezaiti (“High Watchpost”) of Iranian Avesta, a collection of sacred texts of the Zoroastrians. It is believed that Zoroaster was born near Perm. In 1985, Victor Savinykh and Vladimir Dzhanibekov saved the pride of Soviet science and cosmonautics the Soviet orbital station “Salyut-7” from an uncontrollable fall to Earth. Having flown on the “Soyuz T-13”, they had to first find the “Salyut-7”, which had been in orbit in the unmanned mode for the past six months and had not responded to signals sent from the Mission Control Center. For the first time in the world, Dzhanibekov and Savinykh had to conduct a complicated manual docking with the space station that had lost control, chaotically rotating in outer space. In fact, it was a 20 tone block of unmanaged iron. Victor Savinykh and Vladimir Dzhanibekov successfully completed all the tasks. They saved the prestige of the country and Soviet cosmonautics, managed to restore the work of “Salute-7” in the harshest conditions for the subsequent crews. Vladimir Dzhanibekov and Victor Savinykh at that time were the most experienced operating cosmonauts. There was no man who knew the “Salyut-7” better than Viktor Savinykh. Both cosmonauts were chosen and recommended by Alexei Leonov, who was then the deputy head of the Cosmonaut Training Center. In March 1965, Leonov became the first man on the planet who performed spacewalk, exiting his spacecraft “Voskhod 2” (lit. “Sunrise-2”). After returning from the Space in 1965, the spacecraft of Alexei Leonov and its commander Pavel Belyayev (born near Veliky Ustyug) landed nearby the above mentioned Berezniki on the Kama River, north to the city of Perm. The youth of Victor Savinykh was also connected with Perm. Pamir was the call of Savinykh and Dzhanibekov when they flew on the “Soyuz T-13” to the orbital station “Salyut-7”. 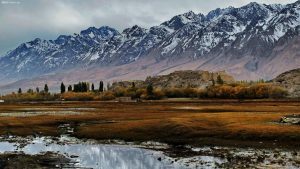 Pamir, called the “roof of the world”, is located in the north of the Himalayas, which are the highest mountain system of the Earth. Palmyra (“city of palms”) is one of the oldest cities in the world. Palmyra is located on the territory of present-day Syria, which has special ties with Russia. There is no single version of the translation of the name Pamir. In Russian, “mir” means peace and society. Pamir if often referred to as the “roof of the world”. In Soviet times, the “roof of the world” had high names reflecting the high ideals of humanity. The highest peak of the USSR was the Communism Peak (7495 m.), Tajikistan. This peak was discovered in the 19th century by Russian researchers of the Pamir. In 1932 it was named the Stalin Peak, and in 1962 it was renamed the Communism Peak. In 1998, it was renamed by the then authorities of Tajikistan after Ismoil Somoni, the 9th century ruler of the Iranian Samanid dynasty. The Samanid Empire at its greatest extent encompassed all of today’s Afghanistan, and large parts of Iran, Turkmenistan, Uzbekistan, Tajikistan, Kyrgyzstan, Kazakhstan and Pakistan. The original home of the Samanids is unclear. It is claimed that their name was derived from a village near Samarkand (present-day Uzbekistan). 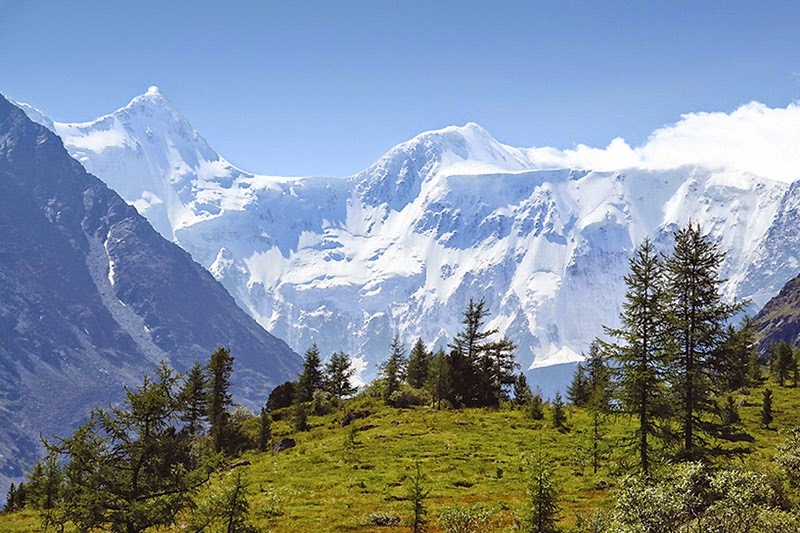 Another seven thousand peak with a high name in the Pamir mountain system was the Lenin Peak (7134 m.), located on the border of Tajikistan and Kyrgyzstan. In 2006, it was renamed after Ibn Sina (Avicenna), a Persian polymath who is regarded as one of the most significant physicians, astronomers, thinkers and writers of the Islamic Golden Age. Avicenna was born in 980 near Bukhara (220 km. west of Samarkand), the capital of the Samanids. In Sanskrit, “bhuHkhAra” is country in Tartary. The Lenin Peak was discovered in the 19th century and named in honor of Konstantin Kaufman, the Governor-General of Turkestan. In 1928, it was renamed as the Lenin Peak, and in 2006 in Tajikistan they renamed it in honor of Avicenna. The highest point of the Pamir (Kongur Peak, 7649 m) is located on the territory of communist China. However, it does not reflect high ideas. Its name translates simply as a brown mountain. Kashmir is another unique place in the Himalayas, in whose name the Russian word “mir” (peace, world) is present. Kashi or the City of Light is the ancient name of Varanasi (the place of the first sermon of the Buddha). Hence, the possible ancient meaning of the term “Kashmir” could be the “place of light and peace”. In the end, it is no accident that until now Kashmir is often called Paradise on Earth. Symbolic and popular in India is the version of the origin of the name Kashmir from the divine sage Kashyapa. Through the Russian language, it can also be confirmed. Kashmir is Kashyapa’s world. There is certain logic in this, considering that in the Indian mythology Kashyapa is also the ancestor of the gods, asuras, nags, people, etc. Kashyapa symbolizes the prehistoric Unity that precedes the Dualism. Symbolical is the monument of Lenin in the historical Russian town of Kashin. 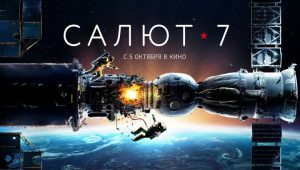 Viktor Savinykh’s diaries have been used to make the film “Salyut-7”. The pre-premiere screening of the film took place on October 4, 2017 in the cinema hall of the State Kremlin Palace. This was the main event of the solemn evening dedicated to the 60th anniversary of the launch of the USSR’s first artificial Earth satellite. The characters and creators of the film met the President of Russia Vladimir Putin, whose surname has a translation from Sanskrit. Also, in Sanskrit, the word “sava” means “commander”. It is present in the surname of Victor Savinykh. The Kirov region has its own ancient ties with the founders of the Vedic civilization in India. It arose in the territory of the modern Pakistani province of Sind, in the Indus valley, on the remains of the Harappan civilization, which existed in the 3rd – 2nd millennium BCE. The capital of the province of Sind is the city of Karachi. This is the largest Pakistani city and one of the largest cities in the world. In the Kirov region there is a village of Karachi and this is not an accident. In neighboring Udmurtia (which has many toponymy names translated from Sanskrit), next to the Kama River, there is the city of Kambarka, and in Pakistan there is the city of Kambar. In the Novosibirsk region (the former Ziberia) there is a bitterly-salty lake of Karachi, which has medicinal properties. Since 1880 it is used as a mud and balneological resort. Salt is the essence of life. 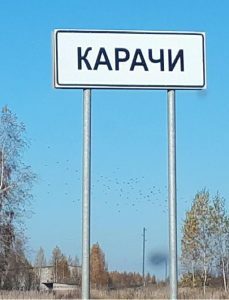 In the central part of Russia there are many settlements with the name of Karacharovo. Karacharovo is a historical district of Moscow, named for the former village of Karacharov, which was part of the capital in 1960. The village of Karacharovo is in the Kemerovo region, the birthplace of the aforementioned legendary Soviet cosmonaut Alexei Leonov. In the Vladimir region, Karacharovo is a village in Sobinsky district (like Alepino) and a micro district in the city of Murom. This former village is considered the birthplace of the hero Ilya of Murom. The magazine “World Channeling” No.4 (36) 2017 (page 155) gives interesting information about Russian folk tale heroes, in particular about Ilya of Murom. It is said that “Simply in the name are amazing codes. «Mu» – is a man, defender. «R» – the native (rodnaya) land, kin (rod). «OM» is a sacred sound that makes to vibrate all the energy channels of the human body, cleaning them, removing blocks and clamps and activating the energy flows in all energy centers. Thanks to the sacred codes, Ilya of Murom got up after 33 year of lying disabled on the stove…». In the Kirov region there is a forest river Shambal. It is known that Shambala is a legendary country in the Himalayas or over the Gobi desert. In Shambala, teachers and mentors of mankind live. Its symbol was on the seal of Tamerlan («One Who Knows Merlin»), the ruler of Samarkand. Two rivers Arya flow in the Nizhny Novgorod region neighboring the Kirov region. 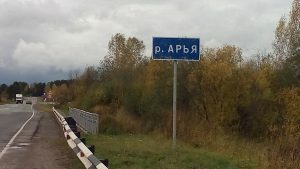 Two rivers Arya are in the Sverdlovsk Region (the Urals). One river Arya is in the Mari El Republic neighboring Nizhny Novgorod and Kirov regions. In the Nizhny Novgorod region there are three settlements with this name: Arya, Small Arya, Big Arya. In Sanskrit, the word “arya” means “noble”. Arya is the mythical ancestor of the Aryans, mentioned in the Avesta. Hence, Iran literally means “the country of Aryans”. The original motherland of the Aryans is believed to be Southern Siberia. In ancient India, the Aryans were the ethnic group Aryans (from the north), representatives of the three highest varnas. River Varna is near Veliky Ustyug that is a part of the Vologda region neighboring Kirov region. Also, Varna is the name of a Bulgarian city and port on the Black Sea. This coastal city is famous for the bronze statue called “The Dragons in Love”. Two dragons, male and female, hold their egg. The Velikoretsk Christian procession in the Kirov region is one of the largest annual religious processions in Russia. It has been known since the beginning of the 15th century. City of Kirov (former Vyatka) is also well known for its icon of the Savior also acknowledged as the Image of Edessa. According to legend, this holy relic consisting of a square or rectangle of cloth upon which a miraculous image of the face of Jesus had been imprinted is associated with King Abgar of Edessa, who wrote to Jesus, asking him to come cure him of an illness. Until the 1917 revolution, a copy of this Kirov (Vyatka) icon was kept above the inner part of the Saviour (Spasskaya) Tower Gate of the Moscow Kremlin. Spasskaya (Saviour) Tower Gate is the official entrance to the Kremlin. The gate got their name in honor of this miracle working icon brought to Moscow by the royal decree in the middle of the 17th century from Vyatka (now Kirov). This icon was kept in the Moscow Novospassky monastery, where the temple-burial vault of the Romanov boyars is located. 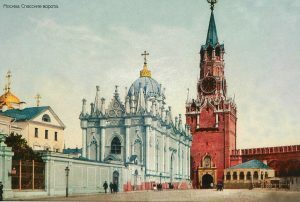 After 1917, the original icon in the Novospassky Monastery and its copy placed over the Spassky (Saviour) Gate of the Kremlin were lost. 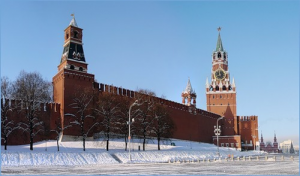 Spassky (Saviour) Gate has been the main ceremonial entrance to the Moscow Kremlin for many centuries. If on their inner side was the icon of Savior of Vyatka (Kirov), then on the outside of the gate was Savior of Smolensk, with the upcoming Sergius of Radonezh and Varlaam of Khutyn. The ancestor of the Romanov family Procopius the Righteous took a monastic vow in the monastery of Varlaam of Khutyn in Veliky Novgorod. It is believed that Khutyn was so named because of the large number of snakes inhabiting there. Vara is not only a vow of fidelity, but also the abode of the righteous in Iranian mythology. 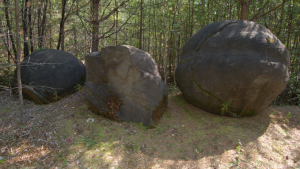 In the Kotelnich district of the Kirov region there is a unique cluster of huge stone balls. There are different versions of their origin and purpose. On an area of about 10 hectares there are about 1,300 large globular stones with diameters ranging from 0.5 to 1.5 m. A lot of boulders have been lost or taken out. Similar spherical large stones are found in various parts of the planet, including the Champa Island (Franz Josef Land), which is part of the polar possessions of Russia. Administratively, this island is located in the Primorsky district of the Arkhangelsk region and is very popular among tourists who cruise the Arctic. The territory of the present Arkhangelsk region is not accidentally called the Northern Kuru, the ancestral home of the founders of the Vedic civilization in India. In this country lives the mysterious Todd tribe. Their ancestors used to possess ancient knowledge and superpowers. 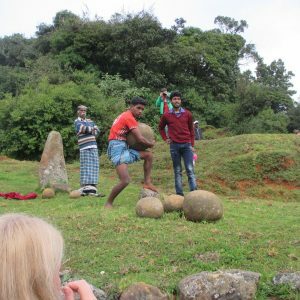 The tribe reveres the inherited stone balls, although smaller than in the Kirov region or on the Champa Island. It is noteworthy that the most mysterious island of the above archipelago in the Arctic Ocean was named after William Champ. In India, Champa is a popular female name. In the Indo-Russian film “The Journey of Three Seas”, Afanasy Nikitin fell in love with Indian girl whose name was Champa. In addition to the huge relict balls, whose estimated age exceeds 250 million years, the Kotelnich district of the Kirov region is known throughout the world for its cemetery of dinosaurs. 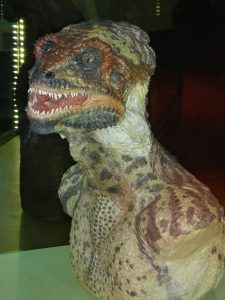 The Vyatka Paleontological Museum in Kirov is unique not only in the extensive collection of ancient lizards discovered in this area along the river Vyatka, many of which have no analogues in the world. 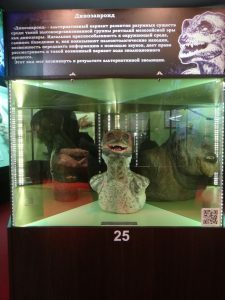 The museum also has a stand dedicated to an intelligent dinosaur (lizard, Draco, etc.). For obvious reasons, it is cautiously called an alternative option for the development of intelligent beings among such a highly organized group of reptiles of the Mesozoic era as dinosaurs. However, the true course of this scientific thought is confirmed by the story of Lacerta. According to experts, these places in Kirov region have a number of abnormal characteristics and new discoveries are possible. The World Channeling magazine reveals about the city of the Light of the 5th dimension located in the Vyatka river basin. The peculiarity of this five-dimensional City is that it contains the Programs of evolutionary development. It can be called a research center to develop ways of combining worlds and dimensions. It is from here that powerful energy-information flows are now moving towards the unification of worlds. Nakhodka is a port city in Primorsky Krai of Russia. Nakhodka is located east of Vladivostok, the administrative center of the Krai, as well as the largest city in the Russian Far East. The Nakhodka Bay of the Sea of Japan, around which the city is organized, was found in 1859 by the Russian corvette «Amerika», which sought shelter in the bay during a storm. In honor of this occasion, the bay was named Nakhodka, which in Russian means “discovery” or “lucky find”. Nakhodka is the southernmost city and port in the east of Russia, its Pacific coast. 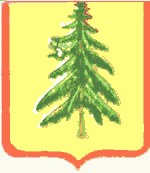 The first coat of arms of Nakhodka was approved in 1973. In this year, were made two of the popular Soviet films related to Ivan Grozny. On the shield of the coat of arms was placed Caduceus that is the main symbol. Symbolism of the coat of arms is multi-level. 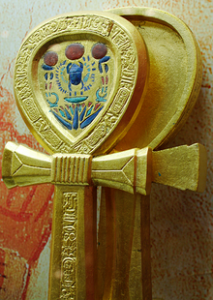 The anchor clearly resembled Ankh or Coptic cross, a symbol of eternal life, leading its origin from ancient Egypt. Opposite the Caduceus are the fish, the ancient symbol of Christianity (born in Egyptian deserts). On the present coat of arms of Nakhodka, two snakes wrapped the anchor whose top is adorned with the wings of Hermes. Nakhodka’s harbors are superior even to those of a much larger port of Vladivostok. Nakhodka is located almost at the same latitude with such places of power as the Bosnian pyramids and the Livadiya Mountain (Pidan), the most visited peak of Primorsky Krai. The Bay of Nakhodka was discovered by the Russian corvette “Amerika” ​​in 1859. Since the end of the 19th century, private households began to appear here. The first Russian settlement, the village Amerikanka (the American), was founded in 1907 and named after the corvette. Thus, the history of the city of Nakhodka began from this first permanent village. Nakhodka is located on the same latitude as the American Boston. The ancient mystery of the stone faces of Brighton Beach unites Russia and America. The village of Amerikanka was founded by settlers from the Chernigov province. Symbolic is the place of their origin. Chernigov (present-day Ukraine) is located on the river with the Sanskrit name Desna. Near the source of the Desna in the Smolensk region, there is the source of the Ugra River, the tributary of which is the river Agra. In India, Agra is most famous for its magnificent Taj Mahal located on the south bank of the river Yamuna. Yamuga is a river in Moscow region. Another river Agra flows in the Vladimir region. Ugra is an epithet of god Shiva (Sanskrit: Siva). It is noteworthy that the first Chernigov prince known from a chronicle was the son of Vladimir the Baptist of Rus, the younger brother of Yaroslav the Wise. For many centuries, Chernigov was the second city of Kievan Rus and the last step to the throne of Kiev. Often, Chernigov was the main rival of Kiev, and sometimes equal in importance. In the spring of 1919, the American was subjected to artillery shelling of the English cruiser Kent. In 2004, the city of Nakhodka was enlarged by including a micro district Livadiya, located on the shore of the Gulf of East of the Japan Sea, near the bay Gaydamak. This name was given in 1861 in honor of the ship “Gaidamak” (Eng. Haidamak or free Cossack), which opened this bay. The term also has been passed to Ukrainian surnames, including Leonid Gaidai, one of the most popular Soviet comedy directors and the creator of the immortal comedy “Ivan Vasilievich Changes His Profession”, which appeared on the screens in the above-mentioned 1973, when the coat of arms of Nakhodka with Caduceus was approved. Far Eastern Livadiya is on the same latitude as the Crimean Livadiya from which it has received its name. Livadiya in the Crimea was Nicholas II’s favorite place. Here, in 1894 after the passing away of his farther, he actually took over the government of the country and was engaged to his wife. The World Channeling magazine provides interesting information about Nicholas II and his role in the Russian and world history. The twin city of Nakhodka is the Chinese city of Girin, standing on the river Sungari, as well as the Chinese city of Harbin founded by the Russians. It is believed that the name of the city of Girin means “River City” in the Manchu. On its territory was located one of the very first cities in Manchuria. From the city of Girin, two lion-like creatures (shih-tsza) were brought to Saint-Petersburg, adorning the Tsar Peter’s embankment near his house set on the Nile meridian. On the territory of the current Girin was the eastern capital of the state of Bohai. Bahai is a religion teaching the essential worth of all religions, and the unity and equality of all people. Its first temple was built in the beginning of the 20th century in Russian empire. The most known Bahai’s temple is the Lotus Temple located in Delhi, India. Delhi is located on the banks of the above mentioned river Yamuna. Village of Delhi is in the Tver region of Russia. Nakhodka and the Japanese city of Maizuru became the first sister cities in the history of Soviet-Japanese relations. Maizuru is located in the northern part of the prefecture of Kyoto on the coast of the Sea of Japan. Kyoto is located in the center of Japan and the island of Honshu. From 794 to 1869 the city of Kyoto was the capital of Japan and the main residence of the Japanese emperors. Kyoto Prefecture borders on the south with the prefectures of Osaka and Nara. These are not simple names. Asoka is the Sanskrit name of the greatest Indian ruler. This emperor Ashoka accepted Buddhism and spread it throughout Asia. Osokino is a settlement on the M-8 in the Yaroslavl region. Earlier this federal highway was called King’s road. Nara is the name of the Russian river on which city of Serpukhov stands (100 km. south of Moscow). In Sanskrit, Nara means “man”, “hero”, and so on. On the coat of arms Serpukhov is a peacock with an open tail. In Sanskrit, the peacock is a maura. Maura is the name of the family of the above-mentioned first Indian emperor Ashoka, as well as a number of settlements in Russia, including the holy mountain Maura near the famous Kirillo-Belozersky monastery (Vologda region). The first Russian Tsar Ivan Grozny (16th century) became a monk of this monastery in the end of his earthly life. Besides the fact that in India the peacock is a symbol of royal power, its open tail also symbolizes the high level of consciousness. On the material level, the peacock is the enemy of small snakes. In India, they often specially have peacocks to protect their sites (lawns) from snakes. Kyoto Prefecture is divided in the middle by the mountains of Tamba, which makes the climates in the north and south of Kyoto very different from each other. Tamba is another multi-level name. The first is the Russian city of Tambov. The second is the city of Inca Ollantaytambo, located 60 km. from Cusco. Cuskovo is a former village, now part of Moscow, the mid-18th century summer country house and estate of the Sheremetev family who were close relatives of the Romanovs ruling dynasty. The third is the main international airport of South Africa, named after Tambo (former President of the African National Congress). After Stalin’s death in 1953, there was a proposal to rename the city of Nakhodka to the city of Stalinomorsk, and the Gulf of America to the Bay of Stalinomorsk. Hannah Beaconsfield has written about the representatives of Sirius, who have given the frequency of vibration of consciousness to the humanoid created on Earth. It was this frequency that determined the most part of that part of human consciousness called the Subconscious. Through it, there is a connection with the whole spectrum of realities existing in the Universe. It is believed that Caduceus is also a reflection of the role of Sirius in the return of mankind to Unity, i.e. integration of polarities (their balancing). 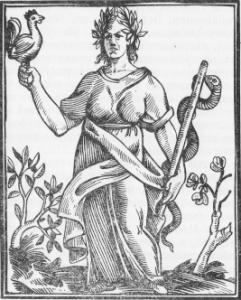 In the hermetic science of alchemy, Caduceus is the principle of the Great Doing that is the alchemical process of transforming the First Kingdom into a philosopher’s stone or the Elixir of life. The Caduceus is the symbol of Hermes, who also acted as the mentor of Eros. It points to yet another great mystery of the Kundalini Energy and gaining the experience of polarity. At the highest level, the sexual expression begins with a difference and moves towards unity. This was how many civilizations have developed. They have ascended from the 3rd dimension to the higher ones, to levels when their bodies became light. One of them is the civilization from the planet Venus described in the Law of One (The Ra Material). They are said to have helped Hermes in the construction of the Great Pyramid and the Hall of the Chronicles. There is a version of constructing the Great Pyramid by the Lemurians. The intertwined snakes are a reflection of the 3rd dimension, where the world has plunged, and the wings symbolize the ascent and exit to the next level. 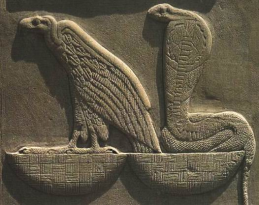 The images of snakes and birds on the Caduceus reflect in symbolic language the division on the opposite sides in the dual world of the 3rd dimension. Fear and darkness are associated with snakes. Love and light are coupled with birds. Mastery is manifested in the ability to integrate the opposites. At the highest level, they are two sides of the same coin (reality). Using images helps to restore a system of concepts in memory. The plot of the bird and snake is found in almost all cultures that have experienced the influence of Sirius. In Egypt, they had a divine status and symbolized the Upper and Lower Egypt, the Union of Spirit and Matter, Consciousness and Subconsciousness. 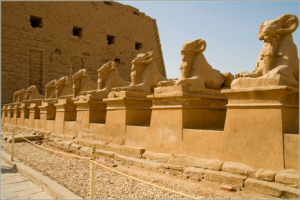 They were placed on the crowns of the pharaohs. 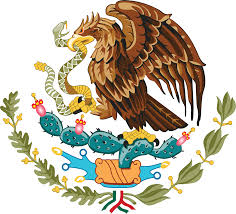 The Mexican coat of arms, based on the legends of the Aztecs, depicts an eagle and a snake. The Aztec images had a deep sacral meaning, but the Europeans have remade and simplified it in their own way. They have stated that it is only a symbol of the triumph of good over evil, as in the case of the image of St. George the Victorious, whose roots go to the Battle of Nibiru and Tiamat. The Bronze Age dates from the end of the 4th millennium BCE to the beginning of the 1st millennium BCE, in which bronze became the main material in the production of tools and weapons. In the Bronze Age Arkaim and Mesopotamia flourished. Bronze is an alloy of a very precise proportion of tin and copper, which cannot be obtained without special knowledge. Tin is not present in nature in its pure form. So, one needs to know how to smelt it. In Mesopotamia, where the Sumerians lived, there were no deposits of metal-bearing ores, but they were fine metallurgists. So they got this knowledge from somebody highly developed. The ancients called bronze and other metallurgical technologies as the gift of the gods. In the Sumerian language, AN means “Heaven”, and ANNA is “Stone from Heaven” (i.e. bronze). In Christianity, Anna is the mother of the Virgin Mary. Another confirmation that metallurgy was the gift of the gods (representatives of highly developed civilizations) is the fact that after its appearance, people would not make such revolutionary advances for thousands of years. They simply continued to use the instructions and methods of work of their ancestors who received the gifts of the gods such as agriculture, metallurgy, writing, science, etc.